The M30 Alarm Dialer is a professional alarm monitoring system designed to help prevent losses on critical and or high value systems, such as pharmaceutical or medical research production lines or laboratories. will instantly alert the correct on call personal whether that be the lab technicians, the building engineers or security. 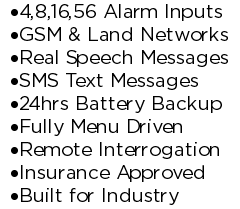 The Alert can be in the form of a speech message, an SMS message or pager alert. The M30 is used around the world by Pharmaceutical, Medical Companies and Facilities including; Merial Animal Health, FijiFilm, Pharmagraph, Asterand, G-Pharm and British American Tobacco. 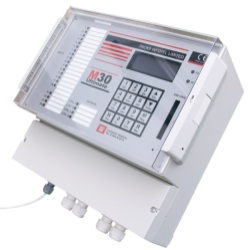 They use our M30 for monitoring their Fridges, Freezers, Process Alarms, High and or Low Temperature Alarms, Power Failure, Generator running Alerts, Security Alarms and their Fire Alarms. Because the M30 is designed and built by us in the UK, we can customise the unit for your exact needs and situation including creating bespoke features and functions.